Ever seen those fancy animated titles that often pop up on TV news clips, pop videos and advertisements? In this article we will briefly discuss how to do something like that and really spiff up your own MMD videos! AVIUTL® Video Editing Software adds animated titles to your MMD Videos! 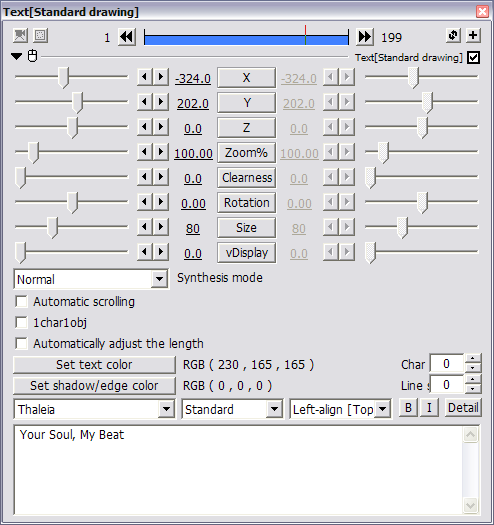 AVIUTL is a Japanese freeware video editor which is offered with the option of adding an English language UI. It is very powerful, easy to learn and is highly popular with amateur video makers worldwide. Due to its popularity, there are many video tutorials on how to get started with it so we will not repeat that information here. It will be assumed in the rest of this article that the reader has some basic understanding on how to use the program. If you’re new to the program, please check out YouTube for video tutorials on how to use the program. All we will be doing here is to briefly explain how to create and animate a title in this article. STEP 1: Create your MMD video. 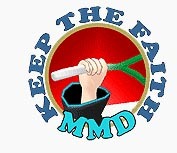 Create an MMD video like you usually do. We used IA Rocks [Unofficial] and the motion/music for “Your Soul, My Beat” to illustrate this article, so at least we have a usable example to show you what is possible. The only different procedure here is that the video is initially rendered without audio as that is added back in using AVIUTL. There’s a technical reason for doing it this way, but in a nutshell, since AVIUTL will treat an imported video file as simply a visual element, it will ignore the audio component so including this in the initial render is silly. We rendered our video using the Xvid codec at a HD size (1280×720 pixels). STEP 2: Import all the needed elements into AVIUTL. The screenshot below shows you how our AVI edit panel looks after all the elements of our video were added. Here is a brief explanation and bear in mind that this panel works in layers with layers towards the bottom drawn after the layers above. For the title to show, it must be below the video file layer as otherwise it will be covered by this layer. Our animated title starts at the lower bottom edge of the screen and remains there for a short time, then it “flashes” and moves over to the left edge of the screen and fades away. AVIUTL comes with tons of neat effects but the general principle is the same for all elements. Each element added to AVIUTL can have (multiple) properties added to it to make the element behave in a manner as specified by the user. we wanted it to appear in the video. This part was done in the main graphical GUI – we just dragged it to where we wanted it to be. Then we specified the duration of time when it will be visible. This is done by just dragging the title element’s bar in the Edit window so that it starts at frame 1 and ends at frame 400. So at the end of this process the title is visible when the video starts and vanishes at frame 401. 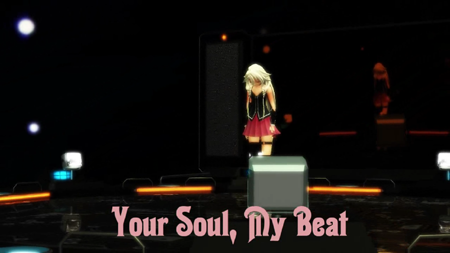 Now if you play back the video you can see the title nicely overlaid above the MMD video. 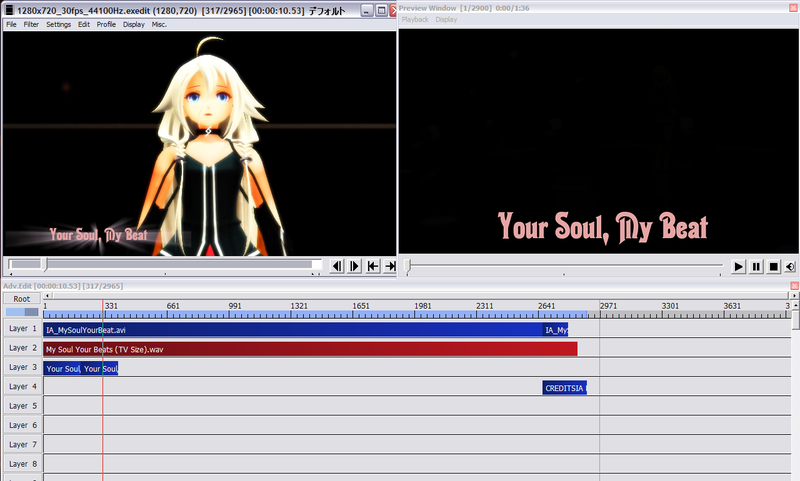 If you managed to do this, you are already way ahead of the average MMD video maker! In the next step, we’ll show you how to be light years ahead of the competition and without breaking a sweat. STEP 4: Splitting our title element. Because we want our title to be readable, for a part of the time when it is visible, it makes sense for it to be essentially static. Then after it is registered in the intended viewers’ mind we can then do something fancy with it. It’ll take the average reader a second or two to read four words so we made our title visible for 400 frames or (400 frames / 30 fps) 13.3333333 seconds. 13.3333333 seconds is a long time for a title to just sit there doing nothing so we’re going to split it into two parts with the first half being static and the second half animated. To split an element in AVIUTL, click on the element in the Edit window display and select either “Add midpoint” or “Split”. Essentially, these commands do the same thing with some major differences that are irrelevent to this discussion. The end result are two separate copies of the same element and if we did nothing else, as far the video is concerned, visually nothing has changed. For the record, I chose to “Split” my title element. STEP 5: Adding animation properties to our title element. All of this is done in the specification window of the second copy of the title element. If you look at the screen capture of this window you can see exactly how it was all done. In terms of the mechanics, I just dragged the title to where it would end up, resized it and made it disappear. What may not be immediately obvious is that the first instance of the title actually disappears from view when the second instance of the title appears. But the process is seamless so it looks exactly like we want: the title remains static for about 200 frames and then is animated for the rest of the sequence. Moved it and specified the type of movement (tween). Note that it gets smaller because the title is moving backwards along the z-axis so further away from the “camera”. Added a fade property to make it fade out over 1 second. 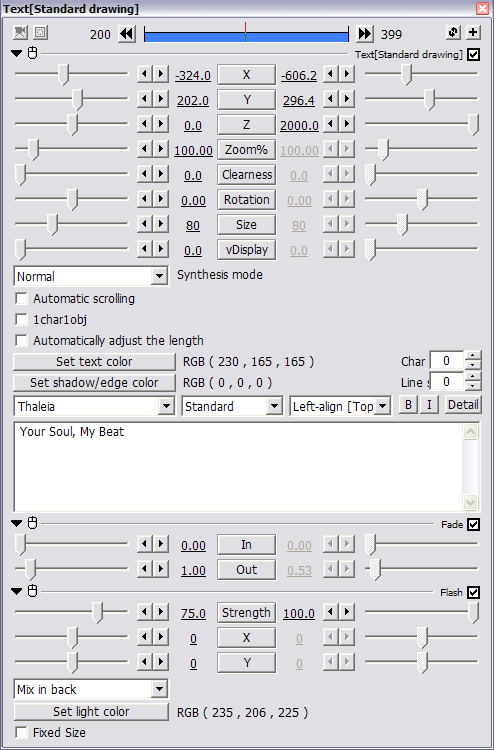 Added and specified the flash properties which can be seen in the screen capture. STEP 6: Render the final version of the video. My video was re-rendered using AVIUTL but still using the Xvid codec and still at HD resolution size, but with the audio component converted into mpg3 format. Then it was uploaded to my channel on YouTube and you can see the end results below. That’s all there is to it! Really easy isn’t it? The only real limits to what is possible in terms of adding titles to your own MMD videos using AVIUTL are your imagination and the technical capabilities of your computer – specifically the capabilities of your graphics card. Then again, most of the effects available as standard with AVIUTL are not very demanding. MME: as listed in the credits at the end of the video. is there a tutorial on how to put side by side scren in AVIUTL or is it even possible. Is it strictly necessary to install new codecs (like UTVideo, H264 etc..) or does this programm work with the condecs originally included in MMD ? Depending on what you want to do, no, it’s not necessary.